We’re back to normal here at The Final Wager. 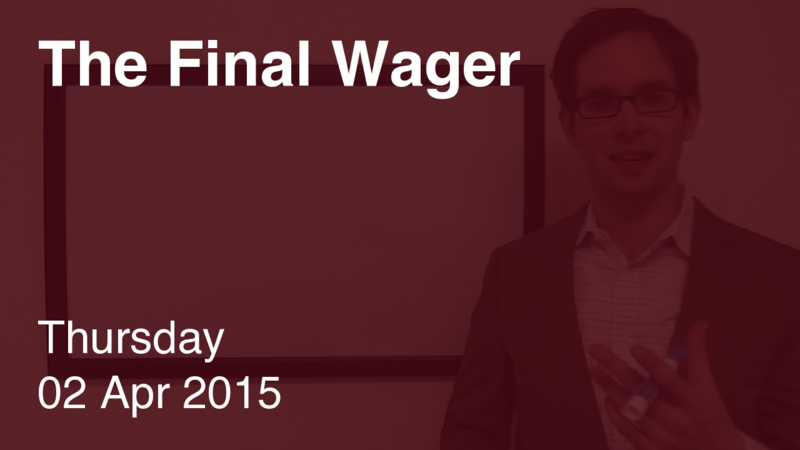 Be sure to check out “the other wagering website,” Just Wager $4,000. Man, had I gotten that Daily Double under “bordering two countries” or whatever, I couldn’t have said “bet it all” quickly enough. Ha, sike! “Sent with a kiss” is a thing? This makes things MUCH more interesting. Why, you ask? Just stick an equals sign and a plus sign into those numbers. If Niels doubles his score, he’ll have 23,600. To cover this all-in wager, Kerry will need to wager 7,000. An incorrect response with that wager will leave Kerry with 9,600. To stay above her total, Niels can wager up to 2,200. Now, here’s where things get fun – Sharon will have this total if she doubles up. We do have one other possibility to consider. If Niels chooses to stay above a double-up by Sharon, he will have at most 14,000. Kerry can stay above that total by wagering no more than 2,600. In that case, Niels must wager 7,400 – but at that point, might as well go all-in. 7,001 4,800 ! 11,800 ! What should each player do? Sharon: everything. Not a dollar less! Niels: People love debating the proper wager for Niels in a situation like this. I almost always advocate for the bigger play – but the tie possibility should swing even the most passive player into that camp, unless he’s completely averse to the category. Kerry: Which is more likely – you and Niels will both get it right, or Sharon will be the only one to respond correctly? Add the dollar, unless you really, really don’t like the category. Had Sharon been the only one to respond correctly, she would have entered a tiebreaker with Kerry. Why risk that? Even more importantly – why risk losing by a dollar if Kerry offers the tie? Once again, a 7,001 wager deprives us of the opportunity for our first tiebreaker.